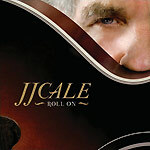 Part of the challenge of being J.J. Cale must be the heightened expectations your fans have for any new album you release. When you've written classic rock songs like "After Midnight" and "Cocaine," well, folks come to expect that sort of inspiration on a regular basis. Even albums that never produced any hits still included at least several great songs, gems like "Blues for Mama" from "To Tulsa and Back" or "When This War Is Over" from "Road to Escondido." And even if you manage to turn out a song that good every album (which he does here, with "Oh Mary"  an absolute gem of a tune), there is still another hour or so of new music to fill out the album. On his new release, Cale (who lives in Valley Center, just north of San Diego), gives us all another dozen songs that most songwriters would trade healthy body limbs for, but that just don't seem quite as sharp or immediately accessible as his last few releases. Maybe it's that the mood here is more subdued even than his usual laconic style. Or maybe it's the natural letdown after the high of collaboration with Eric Clapton on "Road to Escondido." (But even having Clapton sit in on the song "Roll On" can't ignite much excitement.) But for whatever reason, this album never seems to find that sure footing that marks most Cale efforts. "Down to Memphis" is a solid little rocker, as is the opening track, "Who Knew." But the performances seem almost perfunctory. Still, as mentioned there are several nice moments here  and Cale's least-strong songs are better than the vast majority of stuff most other folks will ever write.